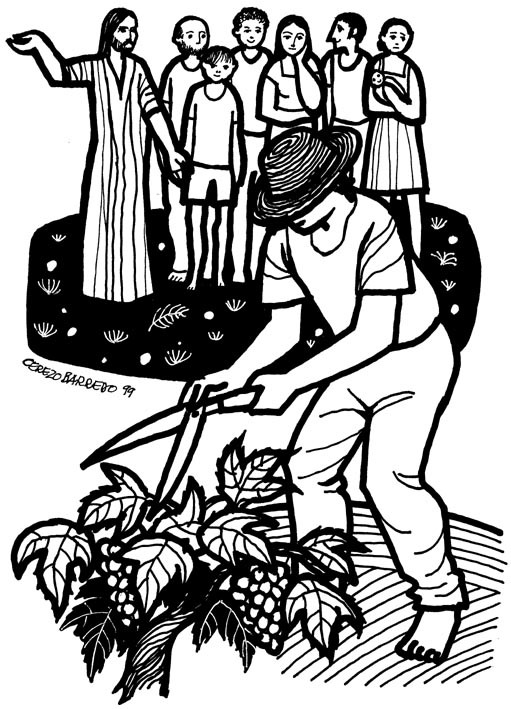 Writing of the Fifth Commandment in The Large Catechism, Martin Luther notes, "In this commandment we leave our own house and go out among our neighbors to learn how we should conduct ourselves individually toward our fellow men." The Fifth Commandment tells us that when we leave our homes, God wants us to be protected not just by parents, but by the whole human family. We, in turn, are to help protect others when they similarly leave the safety of their families. We are, first of all, to respect the sanctity of each other's lives. If you're inclined to skip past this command, telling yourself that you've never murdered anyone, just as I once thought, please don't skip. As far as I can tell, beside the First Commandment, this is the most violated of God's commands. And I'm not referring just to serial killers. Or just to mass murderers like Hitler, Stalin, Franco, Idi Amin, Osama bin Laden, or Saddam Hussein. I'm also referring to people like you...and me...because I doubt that a single human being has kept this commandment perfectly in their lives. Why I say that will become clear in this and the next several posts, I hope. But first, a word about why God cares about our lives so much. Genesis 2 says that God breathed His Spirit into inanimate dust and the first man became a living being. In the Old Testament Hebrew, the word translated as spirit, ruach, can also be rendered as air, breath, or wind. (The same is true of the equivalent word in the Greek of the New Testament, by the way. Pneuma can also be translated as spirit, air, wind, or breath. Like many words in the English language, how these words are to be translated is fairly clearly indicated by the contexts in which they appear.) The point is that God has invested something of Himself in us. We have life because He put it into us. The level of God's investment in our living is underscored in the Bible's first recorded murder. Adam's and Eve's son, Cain killed his brother, Abel. When this happened, God heard Abel's blood cry out. "Where is your brother?" God asks Cain. "I dunno," he responds. "Am I my brother's keeper?" God's answer, of course, is, "Yes." We are all our brothers' and our sisters' keepers. God is so dialed into our lives that the death of one single human being is felt by Him. He expects us to care similarly about others' lives and deaths. Of course, it's in Jesus Christ that we see the depths of God's investment in the human race most clearly. God became a human being to bear our punishment for sin and then, through His rising, to liberate us from death so that once more, we could enjoy oneness with God and with all who believe in Christ. This post has gone on long enough. I hope to resume the discussion of the Fifth Commandment in the next installment of this series. What's in a Girl's Name? It won't be long before some immaculately-coifed and allegedly Christian preacher tells us that because the newly-popular name Nevaeh is heaven spelled backward, parents who use it for their daughters are inviting demons to possess their children. "They're invoking hell," they'll say, their voices dripping with conviction and pleas for contributions that can be made at the 800-number on your screen or by logging onto www.ilovetoripyouoff.com. Mark my word, somebody is going to say that and even more improbably, some will believe them. I must confess though, that I get nostalgic for old-fashioned names like Moon Unit and Anfernee. Conservatives should be wary of the idea that when they talk about, say, tax cuts and limited government -- about things other than abortion, gay marriage, religion in the public square and similar issues -- they are engaging in values-free discourse. And by ratifying the social conservatives' monopoly of the label "values voters," the media are furthering the fiction that these voters are somehow more morally awake than others. Only one Republican senator -- let us now praise New Hampshire's John Sununu -- voted for the measure to take the money for Alaska's "bridge to nowhere" and spend it for Hurricane Katrina relief, and also voted against the Federal Marriage Amendment (which would clutter the Constitution with the definition of marriage as between a man and a woman). The former vote affirmed the value of common sense; the latter, by opposing federal usurpation of the traditional state responsibility for marriage law, affirmed the value of cultural federalism. Is Sununu a values voter? Will concludes by saying that if, after this year's midterm elections, Hillary Clinton and John McCain remain their parties' frontrunners for the 2008 presidential election, "...both...will remain busy courting only values voters, because there is no other kind." Will notwithstanding, I'm sure that there are some voters who aren't values voters, unless you count things like bald self-interest or political cronyism as values. But Will nonetheless has an important point. The very phrase "values voter" has about it the air of condescension that conveys such values as egotism and self-righteousness. The fact is that people operate from different values. One set of values voters may say, "We're pro-life and therefore, opposed to abortion." But another will say, "We're pro-life, too. That's why we oppose capital punishment." One preacher may say that moral Christians are defined by their willingness to oppose the war in Iraq and increase the minimum wage to a specific dollar amount, while his colleague down the street insists that moral Christianity is seen in those who fight slot machines at the local race track and support President Bush's policies. We may disagree with the values on which others base their votes. But we can't say that they're devoid of values. If you're trying to win someone to your argument, you're unlikely to do it by implicitly demeaning them, casting them out of your in-group, the one that really cares about moral values. The problem (well, one problem) with people who dress their particular political preferences in the hues of moral superiority is that they have an essentially pessmistic view of life. They see the camps of Us v. Them as being composed of lifetime members who will never "defect" to the other side. So, instead of trying to persuade others, appealing to their intelligence and their good will, the essence of good democratic discourse, they pump up the exclusionary talk and portrayals of their opponents as irredeemably evil. The leaders of the various values voter camps, many of whom are Christians, could learn a lot from Saint Paul of New Testament fame. When Paul, an evangelist who believed (as I believe) that Jesus Christ is the only way to salvation or relationship with God, arrived in Athens, he found himself in an almost dizzyingly pluralistic environment. There were statues to all sorts of gods filling the city. Paul could have entered the public square full of venom and condemnation, calling all of the good, decent monotheists of the city to rally to him. That may have been momentarily gratifying to Paul. Who doesn't want to feel that they "get it" when the rest of the human race is ignorant or inferior? And the book of Acts says that he was "deeply distressed" at the sight of all these idols. But Paul, himself a recovering self-righteous religionist, didn't cave into that impulse. Instead, when afforded the chance to address the people of Athens, he began by complimenting them. "I see how extremely religious you are in every way." He went on to mention seeing a statue "to an unknown god." I know this God, Paul tells them and proceeds to talk about the God revealed to Israel and ultimately, in Jesus Christ. Paul believed in the possibility of persuading more people to agree with him. But in the politics of exclusion practiced by the moral snobs of both parties today, there is little interest in expanding their base and enhancing their parties' capacity to truly govern. They're perfectly willing to throw red (and blue) meat at the people who already agree with them, believing that by bringing out their own voters, they'll be able to get enough to the polls to squeak by yet another election. Frankly, both as a Christian and a politically-interested American, I'm disgusted by the whole "values voter" business. There are times, of course, when preachers and churches should speak out in political matters. But this should happen only when the witness of Scripture is so clear that no theologian or preacher or layperson could legitimately object that what's being said isn't from God. Rather than trying to impose their wills on governmental policy in this country, Christians who speak of themselves as "values voters" ought to be focused on transforming the values from which people make their political decisions by helping them to know Jesus Christ. (They might find their own values being transformed in the process.) Then, they should trust the Holy Spirit to guide people to do God's will, not to bend to theirs! And we Christians, who believe that we're imperfect sinners saved by the grace of God given in Christ, ought to be humble enough to recognize that even we don't know where God wants the minimum wage to be set. Did You Ever Have an Especially Favorite Article of Clothing? How about Springer v. Springer? Houston beanball pitcher Russ Springer can face off against TV talk show host (and one-time Cincinnati mayor) Jerry Springer. A coin toss could decide who hurls first. Russ could throw fastballs. Jerry could fling chairs. In the opening round, each player would face the other at a distance of ninety feet, wearing a helmet and pads. (Some accomodation might need to be made for Jerry since chairs are heavier than baseballs.) The player on offense could throw their own objects of choice, while the player on defense would simply dodge them. Points would be rewarded for square hits. In the second round, the two Springers could use their weapons of choice to defend themselves. Reality shows have been built on slighter premises than this. If Jerry wins, Russ would be forced to listen to the talk show host's talk on the lessons learned that day, a dreadful fate. If Russ won, Jerry's would likely be pretty beaten up and that would be a roughly equivalent punishment to a Jerry commentary. No matter if the pitcher's motive is to send a message or get back at the other team or whatever, intentionally hitting an opposing batter with a 90-mile per hour fastball has always struck me as a ridiculous and dangerous thing to do. So, I think Houston Astros pitcher Russ Springer's obvious throw at San Francisco hitter Barry Bonds last night was a classless, indefensible act. So, too, was the standing ovation given to Springer by the Houston crowd for his chumpery. Nonetheless, the crowd's response says a lot about how baseball fans everywhere view Barry Bonds. It's impossible to imagine, for example, in spite of all the racist kooks who sent threatening messages to the great Hank Aaron as he moved toward supplanting Babe Ruth on the all-time homerun list, that a baseball crowd in any major league city would have given a standing-O to a pitcher who attacked him the way Springer went after Bonds last night. I'm a baseball fan. Most baseball fans I know aren't wishing that Barry Bonds doesn't beat Hank Aaron. Instead, they don't care about Bonds' alleged race with history. They wish he would just retire. That's because most people don't believe that his homerun totals are legitimate. There's an enormous amount of anecdotal evidence out there that Bonds' round trippers for the past five-plus years have been steroid-powered. If this is found to be true--and Baseball commissioner Bud Selig has no more important or urgent task than learning the truth about Bonds and steroids, Bonds' name should never be spoken of in connecttion with that of Aaron's. If Bonds passes Aaron, his record won't even warrant an asterisk, as was once placed next to Roger Maris' name when he broke Ruth's single-season homerun total in 1961. If Bonds took steroids, every homer he's hit since first using them should be forever expunged from the record books. If Barry Bonds is clean, then baseball needs to clear his name. And that Houston crowd will owe him two apologies: one for celebrating an act of irrelevant violence against him, the other for assuming that all the reports are true. Bonds will probably pass Ruth soon and may even break Aaron's record. But until we have a definitive answer on his alleged steroid use, few will celebrate the way 99% of all baseball fans did the night Aaron went past the Bambino. They'll sit on their hands until they know for sure that the new Homerun King isn't a cheat. The news about the breakup of the marriage of Paul McCartney and Heather Mills adds special poignance to the lyrics of this song from McCartney's latest LP, the finest of his solo career. Macca has rarely been directly autobiographical, although things from his life seap through his lyrics, sometimes involuntarily. The song, Anyway, the final cut on Chaos and Creation in the Backyard, appears to express a desire for the sort of relationship which he and his wife were apparently unable to establish. Except for the few days he was in a Japanese jail on drug charges, McCartney never spent a night away from first wife Linda. 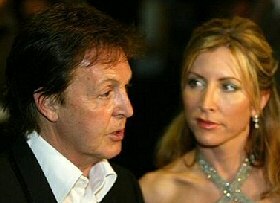 For McCartney, a genuine romantic, the frequent separations from his second wife must have been painful. McCartney is correct in saying that his second wife was thrown into one of the most brightly-burning spotlights on the planet. That couldn't have been easy. Of course, the ultimate culprit in the end of any marriage is sin, the condition of heart and will that makes it impossible for two people to be reconciled or, in some cases, for one or both partners to treat the other with respect. But divorce is always a tragedy, even this one. Charmed by this woman's intelligence, we at first took in her doses of megalomania with good humor. We all tend to flatter ourselves. "All have sinned and fall short of the glory of God," the Bible reminds us. My half-century-plus on this planet has shown me that that's certainly true of me: I do sin and fall far short not only of the way God wants me to live, but even of the way I would like to live. An awareness of my huge imperfections tends to make me charitable toward others' foibles. But as we became more acquainted with this person, something alarming happened. Her stories and her opinions about others became nastier. Her world began to be composed of whoever happened to be kissing her ring at any given time and her. It was a world that shrank to small dimensions. Those she once embraced as dear friends were dismissed if they got in the way of her agenda. The late psychotherapist M. Scott Peck wrote a best-selling book called People of the Lie. In it, he asserted that there are people--some of them warming seats in church buildings on Sunday mornings, some considered the pillars of society--who are given over completely to evil. They're like the people Jesus excoriated in John 8, children of the devil who, when they lie, are simply speaking according to their natures. It all starts at home. So says the Fourth Commandment. Martin Luther explains it this way. To help them to know the God revealed to the world through Jesus Christ. This necessarily entails praying with one's children, reading and discussing Scripture with them, worshiping with them regularly, seeing to it that they are trained in what it means to be a Christian through the ministries of a local church, and striving to be a positive example of a repentant sinner who daily turns to God for forgiveness and new life. These are major responsibilities, not to be taken as lightly as they appear to be by many today. Their magnitude is why husbands and wives willing to undertake them are worthy of honor. Of course, we know that many parents are unworthy of honor. "Fathers, do not provoke your children, or they may lose heart," the New Testament book of Colossians warns. There are parents whose incessant abuse--psychological, emotional, physical, even spiritual--of their children provokes anger and discouragement. Such parents are manifestly not fulfilling the functions of parenthood. The other day, I heard the story of a mother angry with her son because, unlike his two older sisters, who are straight-A students, he'd brought home a report card with a C on it. There was no indication that the little guy wasn't trying. He just got a C. But his mother has been riding him for weeks about it. When I hear stories like that, I almost want to horsewhip the offending parent! How dare they discourage a precious child of God? But I grow equally angry with parents like the one overheard by a friend at a store recently. This father was in a store with his children to pick out Mother's Day gifts. But one of the man's children spied a decorated bottle opener and decided that he wanted it. (The kid wanted a bottle opener!) The father said, "No." Obviously, this kid had learned that "No" meant "Maybe" with his father. My friend said that this kid threw a major hissy fit, screaming that he had to have the bottle opener. Instead of standing firm, the dad relented. He bought the bottle opener, telling the kid, "I don't know why you want it." He wanted it because that father had never taught his kid that there's such a thing as limits. Even Mick Jagger knows that you can't always get what you want. Parents who fail to teach their children this lesson are setting them up for later discouragement and difficulty. That's why I said earlier that discipline is a prime component of love. Whoever welcomes one such child in my name welcomes me. “If any of you put a stumbling block before one of these little ones who believe in me, it would be better for you if a great millstone were fastened around your neck and you were drowned in the depth of the sea. Every parent, in fact, every adult, should pray that they're not stumbling blocks preventing children from having joyful relationships with the God revealed to all in Christ. But by its position at the beginning of the the second table of commandments, a table that deals with our human relationships, this commandment has implications for more than just the relationships of parents and their children. It establishes the expectation that believers in God will have an appropriate respect for authority. No organization, including governments, can function without there being authority. Believers are called upon to voluntarily render their obedience to authorities for the common good. In the New Testament, Christians were told to honor emperors and rulers, none of whom were fellow Christians in those days, because they provided the peace and security needed to for Christians to live their lives and practice their faith. Christians are under the same call of obedience today. We share our lives with many other people. A respectful and appropriate attitude toward those with the responsibility of wielding authority is essential for the functioning of our world. And it really does begin at home. you have to hand it to Rambling Hal for having the courage to publish two articles recently banned and excised from a magazine in her native Jordan. Censorship, as I pointed out when I wrote about Hal's first post on this subject, is not a good idea. Should You Get the new 'Napoleon Dynamite' DVD? According to this review of the new special edition of Napoleon Dynamite, humbly called 'Like, the Best Special Edition Ever!,' you should only if you haven't already got the 2004 DVD release of the movie. There are lots of cool-looking features here. Since Napoleon Dynamite has become my favorite comedy of all time--supplanting Airplane, it's tempting to, like, buy the new special edition. But I'm going to restrain myself; Whaddya think? Gosh! It's interesting how ideas and experiences sometimes converge to give us new insights or to underscore old ones. That's happened to me again over the past two nights. As I've mentioned, one of the books I'm reading right now is James C. Davis' The Human Story: Our History, from the Stone Age to Today, an outstanding book. This story has been replicated time and again in the history of Christianity. Its greatest growth comes not through force of arms or coercion, but on the strength of the gentle witness of love and strength displayed in often persecuted believers. It seems counterintuitive, but it's true: Authentic faith in Jesus Christ cannot be coerced or forced upon people. That's why most Christians I know find the efforts of such disparate figures as James Dobson on the right or Jim Wallis on the left to enlist Jesus as a co-conspirator with their ideological political agendas so distressing. It's also why most Christians I know find the "theology" of someone like Joel Osteen so appalling. Jesus promises neither that we will have easy lives or worldly success if we follow Him. Some Christians have experienced lives of ease. Some have achieved what the world calls success. But Jesus doesn't promise those things to us. Jesus conquered the world through His love. That, in fact, is how He wins people over, even today. People are attracted to Him not because of a promise to make us powerful, but His promise to make us one with God. Through this oneness, we come to know that we belong to God forever. We experience what Paul calls the "fruit of the Spirit." From Christ, we receive peace and so have no need to prove ourselves to God, to the world, or to ourselves. We can simply focus on loving God and loving others and begin to become truly human beings. Through submission to Christ, we refuse to rely on ourselves and rely instead on God. That's how when we are weak, we are really strong; it's God's strength that fills us. There have been many shameful periods in the history of Christianity, when people bearing the Name of Christ have tried to use earthly power to control or subdue others. The Crusades were one such shameful event. There have been others. But such efforts don't reflect the character of the God we meet in Jesus Christ. Nor have they ever won people to believe in Christ as God and Savior. That only happens when Christians rely solely on the power of the humble Savior, Jesus. With the most recent installment of this series, one dealing with the Third Commandment, we reached a kind of milestone in our discussion of the commandments. In the next installment, we'll begin looking at the "second table" of the commandments, beginning with, "Honor your father and your mother." This second table, starting with the most basic of our relationships and fanning out to the rest of those we have in the world, guide and govern how we are to relate to others, the people on this planet who the Bible expansively call our "neighbors." In this, we see what is most important to God. He made human beings, it turns out, in order to create a web of self-giving love between Himself and us and among all of us. Our holy relationships were breached when humanity fell into sin. God's project with us ever since has been to restore those relationships, first with Him and then through Him, with our neighbors. Thankfully, after an honest examination of the Ten Commandments demonstrates how far we fall short of loving God and loving neighbor, God doesn't leave us to wallow in a sense of futility or despair. He has reached out to us through Jesus, offering forgiveness and new life to all who turn from sin and trust in Him. The Gospel lesson shared by many, if not most, of the Christians in the world this past weekend found Jesus telling us, "I am the vine and you are the branches." Connected to Christ by faith, our relationship with Him is restored and our relationships with others are empowered. If the commandments point us to Jesus Christ then, they've done their job. He's a blogger who has been arrested and detained for peaceably seeking an independent judiciary in Egypt. To join the petition drive on his behalf, go here. You'll find background information and links there as well. The last West Wing well evoked both the abruptness and the majesty of the transfer of executive power in this country. Americans underestimate this aspect of our national life. Before George Washington stepped down at the end of his second term, such transitions from one executive to the next were virtually unprecedented. Okay, there was Diocletian, the Roman emperor who retired from power. But he sticks out like a sore thumb, nestled as he was among a string of emperors who were offed and replaced in violent coups. By the way, there was one factual error at the beginning of tonight's show. The outgoing First Lady asked her husband whose idea it was to have an inauguration ceremony outdoors in January in a country north of the Equator. Martin Sheen's Jed Bartlett said that it was Jefferson, Adams, and Franklin. Jefferson wasn't at the Constitutional Convention, which created the presidency and established when inaugurations would happen. At the time, he was representing the country in France. There is nothing in the Constitution mandating an outdoor ceremony. The words in today’s Bible lesson were spoken by Jesus as He sat in that famous upper room with His disciples on the night of His arrest. They’re also words meant for all of us who claim to be His followers today. I want to take a look at a few things He tells us. I am the true vine, and my Father is the vinegrower. He removes every branch in me that bears no fruit. Every branch that bears fruit he prunes to make it bear more fruit. You have already been cleansed by the word that I have spoken to you. That word translated as cleansed can also be translated as cut back or pruned. When I first came to faith in Christ, of course it was good news to learn that God loved me, sins and all. But I learned something else: Before Jesus’ good news can soak down our lives, before we can look to eternity with hopefulness and have the confidence that comes from an earthly future with Christ by our sides, we have to let Him make us miserable. By that, I mean that we must willingly part with the things that obstruct our relationship with Christ, the sins which, if we insist on holding onto them, will block Christ, His forgiveness, and His life from our lives. Will we allow Christ to cleanse, prune, or cut away the things that block His grace and power from our lives and so, live with God forever? Or will we go it alone and be destroyed? Putting God ahead of our own desires can be a jolt. It can also take away habits we’ve come to enjoy or depend on. But putting God ahead of our own desires can also liberating. Through the years, I’ve known many recovering alcoholics. For each one I’ve met, the story of their unfolding freedom from booze has been the same. First, they admitted they had a problem. It wasn’t something they’d wanted to admit. Their alcoholism had become a part of them, like their skin, their friend, their god. To have alcohol removed from them was like being pruned, like having the love of their lives ripped from their arms. Yet, they knew the alcohol was enslaving them and taking them far from God’s intention for them. And so, they relied on their higher power--for the people I’ve known personally that’s always been Jesus Christ--to rip and tear through their defenses, to divest them of the addiction that was enslaving them and to free them to become the people God made them to be. The Voyage of the Dawn Treader is the third volume in C.S. Lewis' wonderful Chronicles of Narnia. Throughout the series, a lion named Aslan is a Christ-figure who dies for the sins of the people who inhabit an alternative place called Narnia. In this third book, a horrible boy named Eustace accompanies two of his cousins, who have been to Narnia before, in traveling to that magical land. For many weeks after his arrival, Eustace is selfish and hurtful and petulant. At one point, he goes off by himself and ends up in the seemingly-abandoned lair of a dragon. There, he covetously ogles jewelry and other treasures. He puts one bracelet on his arm and he is turned into a dragon. In this form, he's lonely and miserable and he begins to realize how horrible he has been toward others. In this state of regret, the lion Aslan comes to him and urges Eustace to rid himself of his dragon skin. Eustace takes off several layers. But he doesn't make much progress, representing the futility of our own efforts to improve ourselves on our own steam. Finally, Eustace submits to allowing the lion to tear away his dragon skin, representing our submission to letting Christ take away our sin. It's painful for Eustace at first. But in the end, he is freed to become his new and better self, precisely the process of forgiveness and growth God wants all of us to undergo through Jesus! Abide in me as I abide in you. Just as the branch cannot bear fruit by itself unless it abides in the vine, neither can you unless you abide in me. I am the vine, you are the branches. Those who abide in me and I in them bear much fruit, because apart from me you can do nothing. Whoever does not abide in me is thrown away like a branch and withers; such branches are gathered, thrown into the fire, and burned. If you abide in me, and my words abide in you, ask for whatever you wish, and it will be done for you. My Father is glorified by this, that you bear much fruit and become my disciples. Many people think that once they’ve said "I do" to a relationship with Christ--once they've been confirmed or baptized or responded to an altar call or recited a creed--they’ve done their religious bit. They put themselves on spiritual cruise control. They confuse belief in God with intellectual assent, as though merely believing that Jesus died and rose to save people from sin and death is heavenly fire insurance. Folks, that’s erroneous thinking: Even the devil believes that Jesus died and rose to save people from sin and death. But that doesn't mean he has faith or that he's going to spend eternity with God. In God’s lexicon, believing in Jesus means entrusting ourselves totally to Him every second of every day. In today’s lesson, Jesus calls it abiding. We could also call it remaining, or staying connected with Jesus, or being steadfast. Those who abide in Christ are the ones who, as Jesus puts it, bear fruit. They end up accomplishing the greatest good for God, even if the world considers them failures. The love and power of God surge through their lives. They have the things that in another part of the Bible, Paul calls “the fruit of the Spirit”: love, joy, peace, patience, kindness, generosity, faithfulness, gentleness, and self-control. Three years ago, I recounted a story told by author John Ortberg, in his outstanding book, The Life You’ve Always Wanted. It’s a story worth re-telling. Mabel was a resident of a nursing home, blind, nearly-deaf, and suffering from a cancer that was hideously disfiguring her face. Bedridden for twenty-five years, with no known relatives, Mabel should have been bitter, incommunicative, self-absorbed. As Schmidt’s acquaintance with Mabel grew, so did his sense of awe. He felt each time he entered her room that he was walking on holy ground. Often, he would read a Scripture to Mabel and from memory, she mouthed the words along with him. Then, she might break into a song praising God. “I never heard her speak of loneliness or pain except in the stress she placed on certain lines in certain hymns,” Schmidt recalls. The student chaplain began going to Mabel’s room with pen in hand, ready to jot down the amazing things that she would say. If anyone had reason to just give up--on God, on Jesus Christ, on living--it was Mabel. But she didn’t give up. She kept abiding in Christ. As I studied this text this week, I began to ask myself some questions. I didn't always like my answers. Let me ask them of you and see what you think. Do you begin each day with Christ? Do you ask for His guidance throughout the day? Do you ask that He help you do His will, to help you love and serve both Him and your neighbor? Do you consider it spiritually dangerous not to worship regularly God along with God’s community, the Church? Are you depending on Him more than anybody or anything? In other words, are you abiding in Christ? Jesus tells us today, “Without Me, you can do nothing.” By that, I think He means we can't do anything of lasting importance, nothing that’s good or helpful, wholesome, healthy, or holy. We need Christ! Jesus says that if we remain connected to Him, submitting to the cleansing of the Father, we’ll bear fruit. Every day, God, help us to be one with You and with Your family, the Church. We surrender our whole selves to You. We’ll do it today and tomorrow and, with Your power surging through our souls, all the days of our lives and on through eternity. We ask nothing more than that you do Your will in us and through us. In Jesus’ Name we pray. Amen. May God help each of us to abide in Christ.